Have all your songs always with you. Anywhere you are with your Android phone or tablet, enjoy music streamed directly from your home computer. Can stream over 2G, 3G, 4G, LTE, and Wi-Fi connections. Offline mode. Once song is cached or downloaded, it can be played offline without connection to Internet. Feature-rich but simple user interface of Muzecast Streamer. Quick search with auto-complete while typing and cross-entity search. One search - searches your whole library and playlists at the same time. Multiple sorting options for Genres, Artists, Albums, Songs, Playlists and Songs. Create playlists on a fly. While listening to a song, you can add it to any playlist or create new playlist. Create playlist out of currently playing queue. Playlists synchronized between devices and stored on home computer in M3U and WPL formats. Easy for ears volume cross-fade between songs while playing in Shuffle or Mix mode. Also cross-fade when changing tracks manually. Caching music locally on device so it can be played offline when you do not have connection to Internet. Download songs (pin) by Album or just single song. With user customizable amount of space to reserve on SD Card, you can download songs to play them offline. Unlike cached songs, which can be deleted when more space is needed, downloaded songs will not be deleted. Browse your library by Genre, Artist, Album, Song, and Folders. Share a song via Facebook or other social sites, Email, SMS. Replay Gain control. All songs are analyzed to normalize volume for each song, so you no longer need to adjust volume for each song. Provides numerous settings to adjust User Interface or listening preferences. Easy to change songs by just sliding artwork on the player screen left or right, or Play or Pause playback by just tapping on Artwork. Read artwork from file TAGS, or picks up image located in the folder. If no artwork found, Muzecast will search Internet for Artwork. Automatically resolves Album Name and Artist Name based on folder structure if Album or Artist name is missing in file TAG. Supports wide variety of DRM-free music files, such as: MP3, OGG, M4P, AAC, MPC, FLAC, APE, WavPack, WMA and WAV. Supports disk images controlled by CUE sheet. Streams in multiple formats, such as: MP3, OGG, and FLAC. Supports 16, 24, and 32 bit audio files. Supports 44.1, 48, 96, and 192 KHz audio files. Multiple audio quality settings from 64 kbps to 500 kbps, including lossless streaming using FLAC. Encoding is done on a fly using latest powerful encoders, such as LAME, FFMPEG, and OGGENC2. Support streaming of original file. Muzecast feature Create Mix is similar to what is also known as Dynamic Playlist, or Radio station. To create MIX you can pick any of the Genre, Artist, Album, Song, or even Folder. 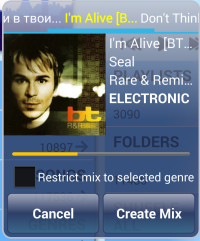 Just simply select "Create Mix" menu from popup menus, or click the button anywhere you see it while browsing your library on your Android device. It will show you dialog for MIX creation like you see on the left. While dialog is shown, it will give you an option to pick any out of 50 randomly selected songs in addition to a song you picked to create mix for. You can scroll through these songs by just sliding artwork left or right. In addition to this you will hear a 30 seconds song preview. Create mix dialog can be controlled via Bluetooth devices, which have Play/Pause/Next/Prev controls. It is common practice by most Internet Service Providers to ban consumers to run any servers using their Home Internet connection. They prevent any Inbound connection from Internet into Consumer home PC or in some cases can shut service down or issue a fine. Muzecast does not require Inbound connection and can work without any TCP port opened for Inbound. All communications are done using only Outbound connection, therefore Muzecast will not violate ISP policy for not running any servers and does not require any ports to be forwarded (opened) in your router/firewall. But Muzecast still provides ability for users, who allowed and want to use Inbound connection and connect directly from Android device to their home computer. If you want to open a TCP port (in case if Muzecast failed to configure your router using UPnP protocol) you can reference http://portforward.com/ for more information about your router and how to configure port forwarding manually. Copyright © VORLAN Group, Inc. 2014. All Rights Reserved.